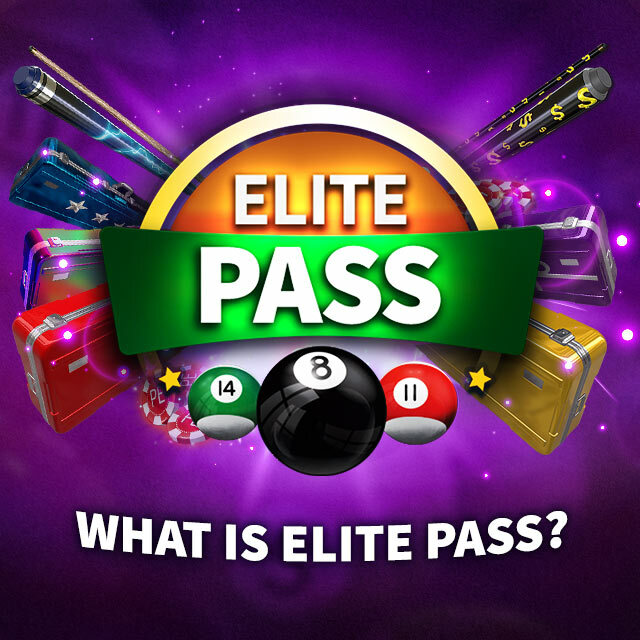 Elite Pass is a new way to earn awesome in-game rewards such as special cue sticks, accessories, tickets, in-game currencies and boosters by playing. The more you play, the more rewards you unlock! Everyone starts with Free Pass and can upgrade to Elite Pass at any time for additional rewards and automatically receive the Elite Pass rewards for every rank up to your current one. Rank represents your progress in Elite Pass and you rank up by collecting 10 stars. So each time you collect 10 stars, your Elite Pass will rank up. ➤How can you collect stars? To collect stars, you can complete your missions, level up your account, play and complete challenge games. The stars can also be collected from Lucky Spin and some cases. ➤What happens when Elite Pass ends? You’ll keep all Free and Elite Pass rewards you’ve earned except XP Boosters. When the next season starts, all players start at Rank 1. Yes, you can purchase one or more ranks by using Purchase Rank button on Elite Pass rewards screen. You will also see which rewards you’ll get before purchasing the ranks. ➤Which options are available for Elite Pass? The Elite Pass has two options: Free Pass which is free as the name says and Elite Pass which can be purchased with 950 Gold. You don’t have to purchase Elite Pass to earn Free Pass rewards but you need to purchase it to get Elite Pass rewards. vWhat if you purchase Elite Pass late in the season? You can purchase Elite Pass whenever the season is active. You can see your progress in the Elite Pass rewards menu and when you purchase Elite Pass, you will immediately unlock the Elite Pass rewards you’ve earned. ➤How does the mission system works? As a Free and Elite Pass player, you start with 8 different missions which can be seen at main menu. The stars at the right side of the missions represent the reward, you need to complete the mission to claim stars. To claim Elite Pass missions, you need to be Elite Pass player. The mission stays there until you complete and claim it or replace it. You can replace one mission per day. New missions appear once a day and you will also be able to see how much time left to new mission. ➤How many stars can you collect from Challenges? You can collect up to 3 stars from one challenge step and 90 stars from a challenge in total. Completing all steps with 3 stars also rewards you with extra stars. It is not possible to collect repetitive stars from completed challenge step. ➤How many stars can you collect by leveling up? The amount of stars that’s rewarded by leveling up increases exponentially as your level. Season Leaderboards shows the Top 100 players according to their rank. It’s updated daily and ends with the season. Surprise gifts will be waiting for you after Rank 100, too!